Please click here to download sample pages in PDF format. A resource ideal for students with social, emotional and behavioural disorders and autism spectrum disorders. 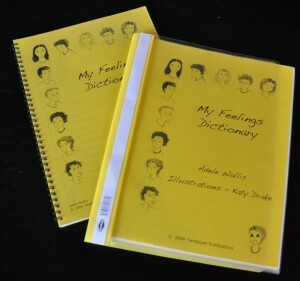 The dictionary comprises two versions - an adult version and a student version, of information regarding 30 basic emotions. It presents the language of emotions within a semantic-based framework, to enable students to understand and use the language and vocabulary of emotions The adult page has been completed, under the following headings: • A definition • Synonyms and Antonyms • How do I know when other people are .... • Things that make me .... • Things I do that make other people .... • A ........ sentence. There is also space to write a personal story that features the target emotion. The student pages provide the same framework and headings, but these are blank as teacher/therapist and student work through them together, personalising each page, and developing their own narrative for each emotion. Pages are given as black line masters.